Model-based control design for ocean vehicles typically starts with a linear approximation of the system dynamics. And for good reason. A control system based on a linearized dynamic model outperforms alternatives when the linear model is accurate, that is, for small perturbations from a nominal state. Control system performance degrades with the approximation, however. In scenarios where the small perturbation model is inappropriate, one must consider nonlinear modeling and control. Some examples include a small surface craft tracking a desired trajectory with a highly variable speed and course angle, a submerged vessel maneuvering near the surface in waves, or a biomimetic vehicle that varies its shape for propulsion and control. After a brief summary of maritime robotics research at Virginia Tech, the presentation will describe the three specific examples cited above. A unifying theme in these examples, and a key element to addressing them, is the mechanical system structure of the governing equations. Although the dynamic models defy the conventional small perturbation approximation, this mechanical structure allows one to apply of a number of powerful tools for control system design and analysis.Model-based control design for ocean vehicles typically starts with a linear approximation of the system dynamics. And for good reason. A control system based on a linearized dynamic model outperforms alternatives when the linear model is accurate, that is, for small perturbations from a nominal state. Control system performance degrades with the approximation, however. In scenarios where the small perturbation model is inappropriate, one must consider nonlinear modeling and control. Some examples include a small surface craft tracking a desired trajectory with a highly variable speed and course angle, a submerged vessel maneuvering near the surface in waves, or a biomimetic vehicle that varies its shape for propulsion and control. After a brief summary of maritime robotics research at Virginia Tech, the presentation will describe the three specific examples cited above. A unifying theme in these examples, and a key element to addressing them, is the mechanical system structure of the governing equations. Although the dynamic models defy the conventional small perturbation approximation, this mechanical structure allows one to apply of a number of powerful tools for control system design and analysis. Craig Woolsey a Professor in Virginia Tech’s Crofton Department of Aerospace and Ocean Engineering (AOE). The principal aim of Prof. Woolsey’s research is to improve performance and robustness of autonomous vehicles, particularly ocean and atmospheric vehicles. The theoretical focus is nonlinear control, particularly energy-based methods for mechanical control systems. 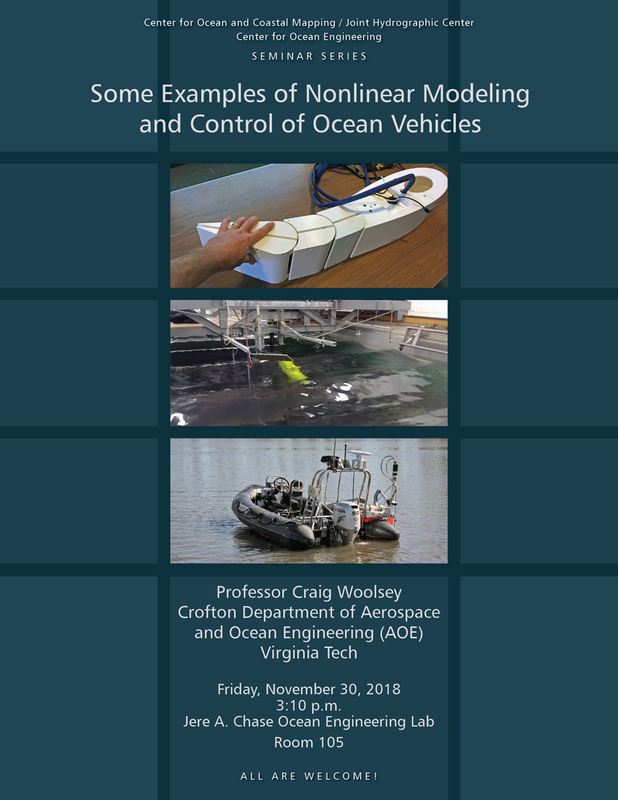 A past recipient of the NSF Career Award and the ONR Young Investigator Program Award, Prof. Woolsey teaches courses in ocean and atmospheric vehicle dynamics and in linear and nonlinear control. With AOE colleagues Mazen Farhood and Cornel Sultan, Woolsey co-directs the Nonlinear Systems Laboratory (http://www.nsl.aoe.vt.edu/). With his colleague Kevin Kochersberger, Prof. Woolsey also co-directs the Virginia Tech site within the Center for Unmanned Aircraft Systems (https://c-uas.org/), an NSF Industry/University Cooperative Research Center.